Comments and Testimonials from some of our many satisfied customers. Excellent advice given prior to installation. A high quality job completed on time. Removed old fireplace and surround and install a new Gazco Gas fire with balanced flue. Clive made an excellent job of fitting the Gazco gas fire, repositioning the gas pipe, fitting the balance flue. The Portuguese limestone was a brilliant recommendation from Clive and the finished product looks amazing. We would certainly recommend Adept Fireplace Installations. I am very happy with the work. The installer was polite, friendly, tidy and on time. I am highly impressed with the finished work - it looks better than expected. Highly recommended tradesman, I would definitely use the company again but sadly I only have room for one open fire. 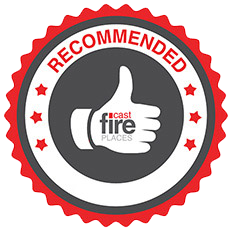 Clive Whitman was helpful, punctual and professional throughout our survey & fireplace installation. He took great care with the finish & we would recommend him, we're glad we chose him. I had a number of quotes for converting my fireplace but by far the most competitive was that given to me by Clive. It was not just the value for money but also his obvious knowledge and enthusiasm that I was most impressed with. Whilst other companies had suggested work which was unnecessary I was extremely impressed by Clives honesty. I would have absolutely no hesitation in recommending Clive to anyone. I feel he is an honest craftsman who fulfilled all my expectations on doing a professional job. Having bought a 1960s ex council house we had the gas fire removed which left a small hole in the chimney. Having looked on line we found a few local CORGI gas fire fitters, Clive was the first to reply and turned up with in an hour for a free valuation. We found him very friendly and great value for money. Having agreed a date to fit our new inset fire Clive turned up and spent the whole day knocking out the chimney fitting the gas fire and plastering the brest. We got home to a well fitted working gas fire and a tidy house. I would recommend Clive to anyone. Clive was always punctual, polite and friendly.He was very professional and provided a refreshingly high standard of expertise.Even though he found some complicated problems when he actually started the installation, he said he would find an answer which he did with no fuss and no extra payment, Clive is a rare individual in the home improvement area. Clive inspected the existing fireplace and chimney so we knew exactly what to expect. There were no hidden surprises for us, although fitting the new fireplace did cause him extra work. He took care to cover everything so there was minimal dust. We were impressed that he took time to make sure everything fitted perfectly and it was evident that he took pride in his work. We would recommend him to anyone having a new fireplace fitted.